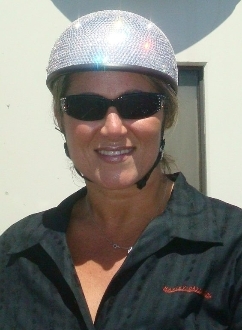 Our "Disco Ball Helmet"™ has been featured on FOX News, Helmet Hair, and Riders Review magazines. It is a SERIOUS HEAD TURNER for those ladies who want to sparkle and shine on the road. YOU WILL BE SEEN! The helmet price here is for our Voss Beanie Bullet silver chrome helmet (non-DOT). However, we will use your comparable sized helmet for the same price (cusomter pays shipping). The helmet can be done with your DOT half or full face helmet and can be created using crystal clear Swarovski Crystals or color crystals for an additional cost. We also design custom helmets to create a style for you and will work with you to create a design within a price range that works for you. Contact us for a price quote for custom work. Please note: shipping charges will be calculated when order is placed directly with us, if it doesn't calculate in the shipping cart, let us know. We also bling out ski helmets, rollerblaing and bicycling helmets. **Price quoted here is dependent on the size dimensions of your helmet. Half helmets and full helmets are additional. Email us for pricing on those helmets.